ALBANY — Much of the praise for the Raise the Age initiative, which was passed by the New York Legislature over the weekend, was effusive, with various political factions claiming it as their own victory and its supporters calling it a historic protection for juvenile defendants. To be sure, the law — signed Monday by Gov. 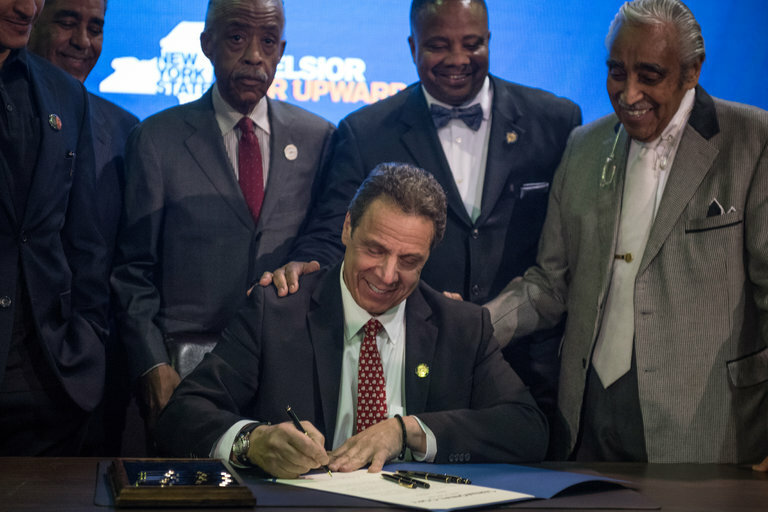 Andrew M. Cuomo in a celebratory ceremony — represents a major change in how the state deals with 16- and 17-year-old defendants, diverting the majority of those cases directly to Family Court or to judges with access to social services and special training. All of which gave Mr. Cuomo another political victory on a progressive issue, albeit one that was necessary only because of the state’s seemingly retrograde attitudes: Before Monday, New York was one of only two states, with North Carolina, to view 16- and 17-year-olds as adults in Criminal Court. “The most liberal, most progressive people, and we have the most cruel, the most unjust result you can imagine,” Mr. Cuomo said, speaking alongside the Rev. Al Sharpton and Akeem Browder, the brother of Kalief Browder, whose 2015 suicide exposed the danger of holding minors in adult prisons. Still, the approbation for the bill was not universal. After weeks of hard-fought negotiations, the resulting bill left some who had sought the law disappointed in its many subsections and stipulations. Some sections of the new law are simple: 16- and 17-year-olds accused of misdemeanors — who make up the vast majority of juveniles arrested — would have their cases handled in Family Court. The picture gets more complicated, however, with nonviolent felony cases, which would still start in Criminal Court, albeit in a new section known as “youth part” and in front of judges trained in Family Court law. Once there, the 16- and 17-year-olds would be automatically sent to Family Court after 30 days unless a district attorney proved “extraordinary circumstances,” a term that is undefined in the law. Those arrested in violent felony cases — which make up about 1 percent of the more than 20,000 juvenile charges in New York per year — could also be diverted from youth part if they pass a three-part test: whether the victim sustained significant physical injury, whether the accused used a weapon, and whether the perpetrator engaged in criminal sexual conduct. The law will also change rules for the detention of juveniles in places like Rikers Island. Beginning Oct. 1, 2018, offenders under 17 will no longer be held in county jails, with a similar rule for 18-year-olds taking effect a year later. That, the law’s defenders said, is a measured and well-thought-out approach to crime and the still-forming consciousness of youthful offenders. Mr. David added that although the phrase “extraordinary circumstances” was not defined, he believed that it would be widely understood as “remarkable, exceptional, amazing, astounding, incredible,” and that the vast majority of youths arrested would end up in Family Court. The law’s text ran more than 25,000 words, reflecting the intense back-and-forth between its Democratic backers and the Republican Senate leaders, who sought a number of conditions before agreeing to back the bill. The negotiations bogged down on several occasions before the Assembly agreed to a version last Tuesday night, Mr. Cuomo said. The state budget, of which Raise the Age was a part, finally passed on Sunday night, nine days late. But, she acknowledged, “we were starting out in a really horrendous place” of being only one of two states to view juveniles that way. “It’s huge success to finally shed that designation,” she said. Still, the leading Democrat in the State Senate, Andrea Stewart-Cousins, was more measured in her praise. Supporters of the bill included Ms. Stewart-Cousins’s frequent sparring partner, the Independent Democratic Conference, a breakaway group of eight Democrats that rules the Senate with Republicans; the group was quick to take credit for it. Ms. Montgomery said she believed the law could still allow some juveniles to end up in adult facilities. But over all, she seemed pleased. An article on Tuesday about legislation that changes the way in which New York State deals with 16- and 17-year-old defendants, diverting the majority of those cases to Family Court, referred incorrectly to the death of Kalief Browder, a minor who was held with adult prisoners. He died at his home, in the Bronx — not at the jail complex on Rikers Island.